“Decongesting Europe: New approaches to freeing our cities”. 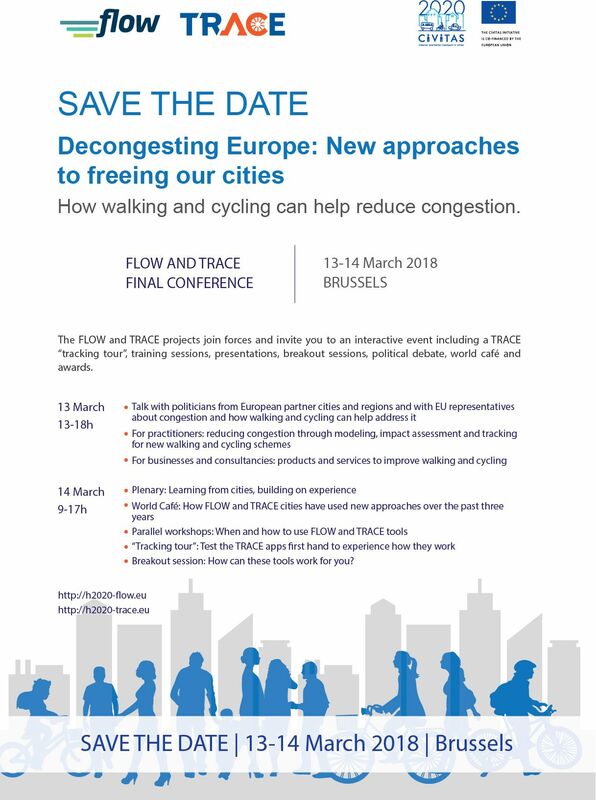 FLOW joins forces with the TRACE project and invites you to a final interactive conference on 13-14th March 2018 in Brussels titled “Decongesting Europe: New approaches to freeing our cities”. Both CIVITAS projects have worked with transport data and developed new ways to boost walking and cycling as a way to reduce congestion. The final conference will make the projects research conclusions accessible to many more cities and regions. The two-days conference will feature a political plenary where the role and importance of congestion will be addressed and where the outcomes and recommendations from the projects presented. In the afternoon of the first day, there will be three parallel sessions targeted at politicians and decision makers, practitioners and researchers to discuss about new ways to plan for walking and cycling, how walking and cycling measures can help address congestion, and what is still required in terms of data and policymaking for future European research projects. Other topics will include how to understand travel behaviour and engage with communities, how to use psychology to build behaviour change campaigns, what tracking can provide to travel behaviour change, and which strategies can increase its impacts. During the second day, participants will get the possibility to get hands-on with the projects’ tools during the two parallel sessions each of which featuring three different workshops. During the lunch break there will also be a practical TRACE "tracking tour" where participants will have the possibility to test the behavior change mobile apps that the project has developed (more information below). The conference draft agenda and registration form are here. The mission of FLOW is to put walking and cycling on an equal footing with motorised modes as a solution to tackle urban congestion. The project has developed a multimodal analysis methodology involving traffic modelling in order to fully understand how walking and cycling impact on congestion. FLOW’s tools are being tested in its partner cities of Budapest, Dublin, Gdynia, Lisbon, Munich and Sofia.